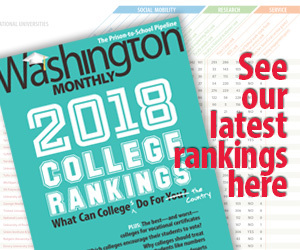 Washington Monthly | Hope for the Future of Affirmative Action? Hope for the Future of Affirmative Action? Inside Higher Ed has an interview with James P. Sterba, the author of Affirmative Action for the Future, a defense of affirmative action. Most opponents of affirmative action can be convinced to change their minds because they have formed their opinion about affirmative action knowing no more than half the facts and half the arguments that are relevant to an assessment of the practice. Once they get a fuller picture of what is relevant to an assessment of the affirmative action, they are confronted with good reasons to change their view. For example, once opponents do a comparative evaluation of diversity affirmative action against two other preference programs in higher education – legacy preference and athletic preference – each of which is twice the usual size of the college or university affirmative action program, it is difficult for them not to see the superior moral and educational justification of diversity affirmative action. Legacy preferences are an important, underutilized touchstone in this debate. Pro-affirmative action folks have simply dropped the ball by not loudly pointing out how ridiculous it is to oppose affirmative action but to sit idly by while legacy policies continue unabated.